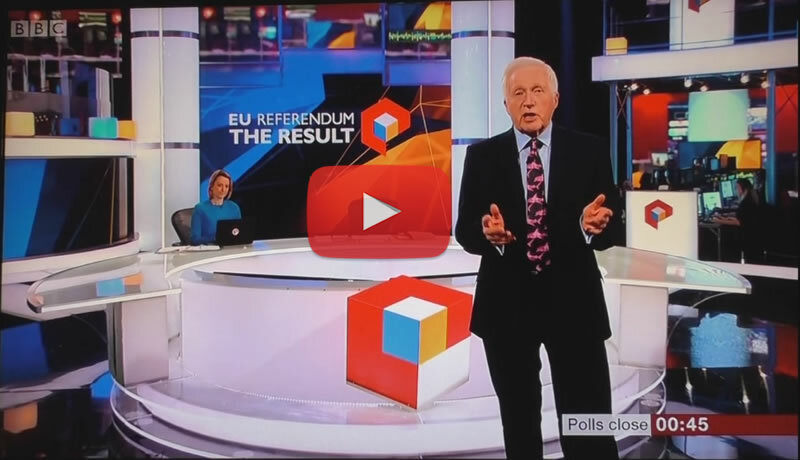 BBC EU Referendum Result Highlights - YouGov, Markets, Bookmakers, Pollsters ALL WRONG! 1. YouGov poll gave the referendum to REMAIN at 52% to 49% for LEAVE. 2. Sterling and stock futures soared in anticipation of a REMAIN win. 4. The book makers also heavily discounting a REMAIN win, where even the likes of Alex Salmond mentioned that Betfair had been giving long odds of 14-1 on LEAVE. Which is set against my forecast conclusion as of 12th of June on the basis of a year long analysis of more than 120 articles and more than a dozen videos that LEAVE would win the referendum on a forecast 51.3% against 48.7% for REMAIN that resulted in trading and betting strategies going into the polls that I will cover the outcomes of in my next comprehensive video. Nadeem, I like many look forward to your post-apocolyptic analysis. A little sarcasm, but this is truly not a credit event and UK Banks such as Barclays have been pounded. I'm sure you are assessing the aftermath and wanted to see when you will be posting your next article as to market expectations going forward. Well I did say to be short stocks and sterling going into Brexit day, and that the FTSE and sterling drops would be temporary. A year from now everyone including the markets will be applauding Britians wise decision. Barclays overseas forward earnings just reaped huge rewards with this overnight currency devaluation, and I agree 100%.